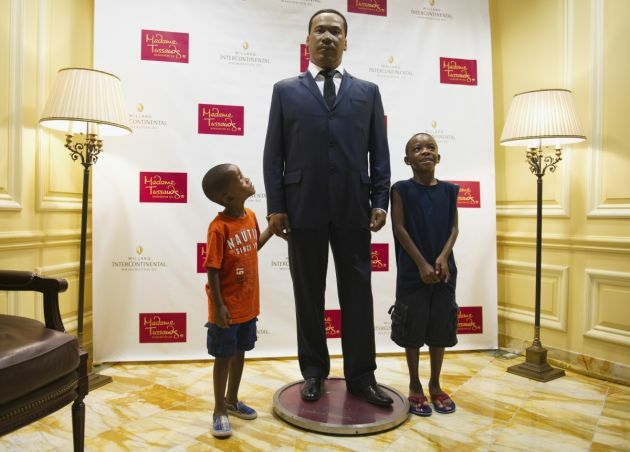 (Photo: REUTERS/Mary F. Calvert)Orion Hicks-Bey, 3, and his brother Omarion Hicks-Bey, 8, of DC, stand next to a wax figure of Rev. Martin Luther King Jr., courtesy of Madame Tussauds D.C., on display in the lobby at the Willard InterContinental Hotel in Washington, August 25, 2013. The King Center and the Willard Hotel hosted an "I Have a Dream" gospel brunch highlighting the music that inspired Martin Luther King during his lifetime and the 'I Have a Dream' speech King worked on at the Willard in August 1963. WASHINGTON DC (Reuters) - Tens of thousands of marchers converged on Washington on Saturday to commemorate the 50th anniversary of the Reverend Martin Luther King Jr.'s "I have a dream" speech and to urge action on jobs, voting rights and gun violence. Sharpton and other speakers paid tribute to King and other civil rights leaders for progress over the past five decades that led to significant gains, including Barack Obama's election as the first black U.S. president. But the shooting death of unarmed black teenager Trayvon Martin in Florida last year and the Supreme Court's recent decision to strike down a portion of the nation's voting rights law showed the struggle was not over, they said. "King saw the possibility of an Obama 50 years ago. The world is made of dreamers that change reality because of their dream. And what we must do is we must give our young people dreams again," Sharpton said. (Photo: WCC / John Taylor)Among the witnesses to the Christian faith are also "martyrs" of our time "who died confronting injustice for the sake of the gospel", such as Martin Luther King. The "National Action to Realize the Dream" was led by Sharpton and Martin Luther King III, King's oldest son. "We ain't going to let nobody turn us around. We're going to keep marching down to freedom land," King told the crowd. "I know that Daddy is smiling up above knowing that your presence here today will assure the fulfillment of his dream." Organizers expected 100,000 people to attend the rally and march from the Lincoln Memorial in the National Mall to the Washington Monument, passing by the Martin Luther King Jr. Memorial. The National Park Service does not make crowd estimates and organizers did not immediately respond to request for their own. Under a bright blue sky, a huge throng of people crowded both sides of the 2,000-foot-long (610-metre) reflecting pool east of the Lincoln Memorial. More than 40 groups participated in the march, among them the Service Employees International Union, the National Association for the Advancement of Colored People and the American Federation of Teachers. It aimed to call attention to job opportunities, voting rights, gun violence, women's rights and immigration reform. Despite big gains politically and in education, nearly half of those who responded to a poll by the Pew Research Center in Washington, think far more needs to be done to achieve the color-blind society that King envisioned. King was among six organizers of the 1963 march, and led about 250,000 people to the Lincoln Memorial and delivered his "I have a dream" speech from its steps. The speech and march helped spur passage of the Civil Rights Act and Voting Rights Act in 1964 and 1965, respectively. 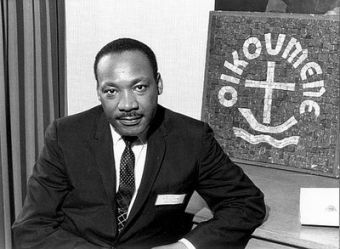 King won the Nobel Peace Prize in 1964. He was assassinated on April 4, 1968 at age 39. That is still a bitter memory for Velma Lois Jones, an 82-year-old former math teacher from Memphis, Tennessee, who participated in the first march 50 years ago and was back on Saturday to help keep King's dream alive. "I was down at the Mason Temple where he was going to speak that night, waiting for him to come, when I got the news. And it was a devastation," Jones said. "We've got so much hate in this country that eradicating it will never end," she said. "But the fact that I'm here says I have hope that things are going to be better." Obama is scheduled to speak on Wednesday at a ceremony marking the actual anniversary of the march at the Lincoln Memorial. The commemoration will include a nationwide ringing of bells at 3 p.m. EDT (1900 GMT). Charles Wise a 61-year-old nurse, said he traveled from Brotmanville, New Jersey with his wife for the march because "the way things are going, participation is required." "You can't stand on the sidelines and hope things get better. You have to get out and make them get better. When they start to go after voting rights, as many of us that died for those, the answer is 'hell no,'" Wise said. Harrison Hawkins, a retired Smithsonian museum worker who celebrated his 70th birthday this week, remembered there was far less security at the 1963 march. While most of the crowd on Saturday was kept at a distance from the Lincoln Memorial, Hawkins said 50 years ago "you could walk around here. There wasn't anybody stopping you. I got up on the steps" to listen to King's speech. Like others at the march, Hawkins acknowledged that black Americans have much more freedom than they did in the early 1960s and said he still marvels that a black man has become president. "There's been a lot of changes, but there needs to be a lot more. The Congress needs to let Barack Obama do his job ... They're holding him back. They won't let him do anything just because he's a black man," Hawkins said. Many young blacks were outraged by the Trayvon Martin case and what they see as an assault on voting rights, but said they also were worried about finding a job to pay off tens of thousands of dollars of student debt. "Right now, I work part time, but it doesn't pay for anything," said Naada Boulandi, a 29-year-old aspiring interior designer from Silver Spring, Maryland, who graduated from college in May. Mel Wilson, manager for social justice and human rights for the National Association of Social Workers, said that is a problem that many minorities face. "We still deal with massive unemployment, disproportionate unemployment among black and Hispanic youth and that needs to change," the 66-year-old said.